Turnbull Manufacturing Company is pleased to announce our newest project. The new “Open Range” Single Action Revolver. Building on the success of the Cowboy Classic Revolvers, Turnbull Manufacturing Co. has begun production of our own line of Single Action Revolvers. Each revolver is hand assembled and polished to the exacting standards our customers have come to expect. Initial production will be limited to revolvers chambered in 45 Colt with either 4-3/4” or 5-1/2” barrels. Additional calibers and barrel lengths can be special ordered as production supply allows. The standard grips on these revolvers will be one piece walnut. Each set of grips is hand fit and shaped for a perfect fit. Other grip materials such as fancy wood, stag and ivory are available at an additional cost. 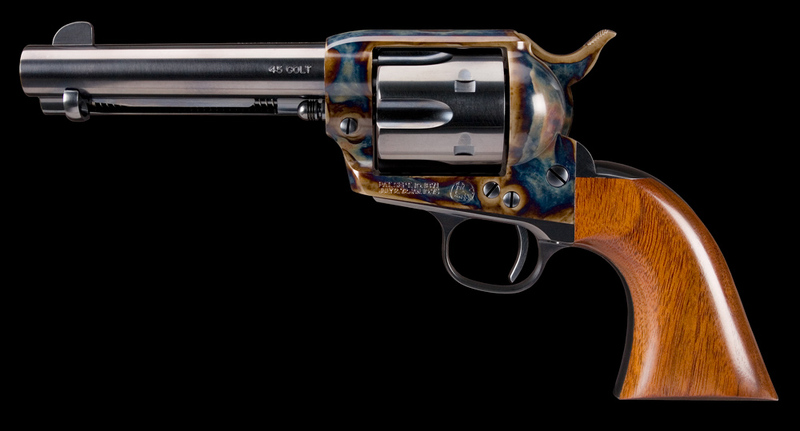 Price for these revolvers as pictured will be $1,650, plus shipping. Contact Turnbull Manufacturing Co. to place your order for our new Open Range Revolvers.